In the spring of 2005, National Geographic photographer James Balog headed to the Arctic on a tricky assignment: to capture images to help tell the story of the Earth’s changing climate. That first trip north opened his eyes to the biggest story in human history and sparked a challenge within him that would put his career and his very well-being at risk. Chasing Ice is the story of one man’s mission to change the tide of history by gathering undeniable evidence of our changing planet. James Balog set about trekking across the Arctic region and, using time-lapse cameras, created The Extreme Ice Survey. Using techniques, untested in bitterly cold, subzero temperatures, he battled for years to pull together evidence of the effects of climate change. The astounding videos he recorded shrink months and years into seconds to highlight how ice is literally disappearing from the landscape. 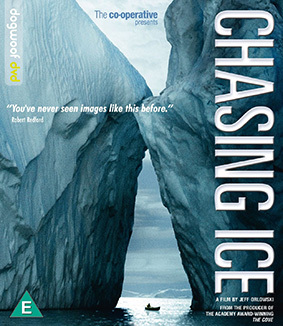 Chasing Ice gained huge critical acclaim on its cinematic release and helped convert even the most hardened climate change sceptics and now it comes to DVD and on Blu-ray, so its amazing imagery can be seen in its high-definition glory. Interview with Composer J. Ralph about Oscar Nominated "Before My Time"